Do you love horses but don’t own one? Would you like to learn more about horses and be in a club with other people who like horses, too? 4-H has the answer for you! Do you enjoy working with youth? Would you like to help young people develop life skills as a volunteer leader? 4-H has the answer for you, too! The North Carolina 4-H Horse Program offers several ways for youth, ages 5 – 19, to participate. If you are interested in joining a club, contact your local county 4-H Agent to locate a group that is the right fit for you! Horse Bowl – Use your knowledge of horses and related subject matter to compete on a four-member team against other teams. Display your knowledge in a competitive and friendly atmosphere. Competition is open to everyone, with teams divided according to age into Junior, Mixed (Junior and Senior), and Senior Divisions. State winners travel to national competition. Record Books- List your goals, experiences, activities and accomplishments in a Horse Project Record book. Turn your record book in each year to review the previous year’s work. Complete the three record book levels in one to several years. Learn about horses and related subjects at a level appropriate for your age and experience. Cumulative Records – Summarize your 4-H activities and experiences over a period of several years in a cumulative record. Competition is held at the district, state and national levels. Scholarships are awarded to the national winners. Hippology – Blend your knowledge and skill acquired in horse judging, bowls, public speaking, presentations (demonstrations), and showing into one activity called Hippology. 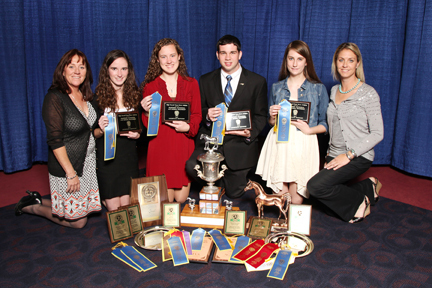 Compete for the Junior or Senior Horseman-of-the-Year Awards. Competition is open to individuals and four-member teams. The top contest individuals participate in national competition. Community Service Projects – Get involved in handicapped riding, ride-a-thons, sharing your horse with rest home patients, etc. Help volunteer leaders plan and conduct community service projects. Retreats – Meet other 4-H’ers and volunteer leaders who are interested in horses for a weekend retreat at various locations in North Carolina. Make new friends from across the state and expand your horse knowledge. Experienced horsemen in various horse-related areas will conduct clinics and demonstrations. Horse Public Speaking – Share your knowledge with others by participating in local, district and state horse public speaking contests. The state winner is eligible to represent North Carolina in regional and national competitions. Horse Presentations – Teach others how to do something related to horses by giving an illustrated talk or demonstration. Compete as an individual or on a two-member team. The state winner is eligible to represent North Carolina in regional and national competition. Horse Shows – Compete at many local 4-H shows. 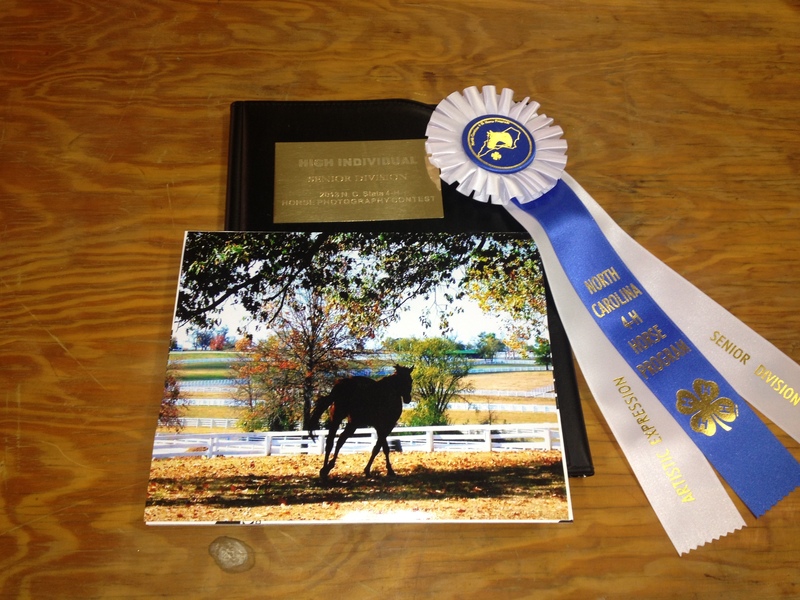 Qualify to show at the qualifying, state and regional shows held annually. The North Carolina State Fair also provides classes for 4-H members only. Horse Judging – Learn good conformation, breed character, and performance ideals indifferent breeds of horses. Learn to evaluate horses based on knowledge and facts and give oral reasons to defend your decisions. Four-member teams and individual judges place several classes of conformation (halter) and performance classes. 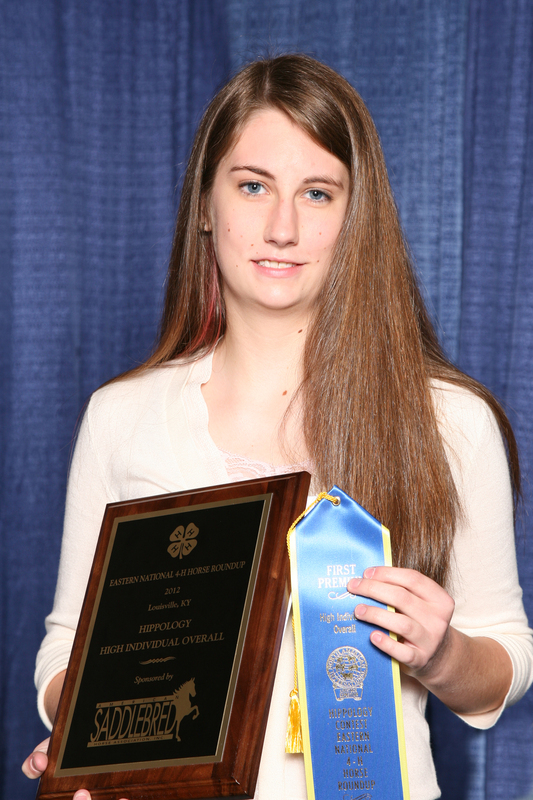 State winners receive travel scholarships to participate in regional and national competitions. Horsemanship Camp – Attend horsemanship camp with your horse for one week each summer. Increase your horse knowledge and skills through riding instruction and demonstrations. Learn about your horse while having fun with your 4-H friends. Are you a volunteer leader who would enjoy helping out? 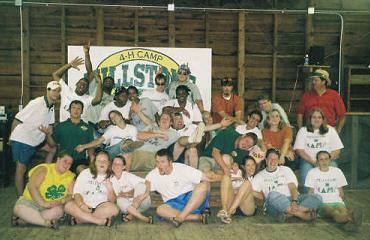 View NC 4-H Horsemanship Camp Home Page to get any of the applications or see additional information about this great learning experience. Trail Rides – Join other 4-H’ers and adults on a fun trail ride organized by local clubs. Cloverbuds – Participate in the Cloverbuds, a special program for youth 5 – 8 years of age. Special manuals, educational experiences and show classes are offered. View the NC 4-H Horse Program Cloverbud Manual: A manual designed just for the the cloverbuds and the supplement, NC 4-H Horse Program Cloverbud Manual Leader’s Guide: This is a guide for the Horse Leader/Parent to assist the cloverbud in learning about horses. 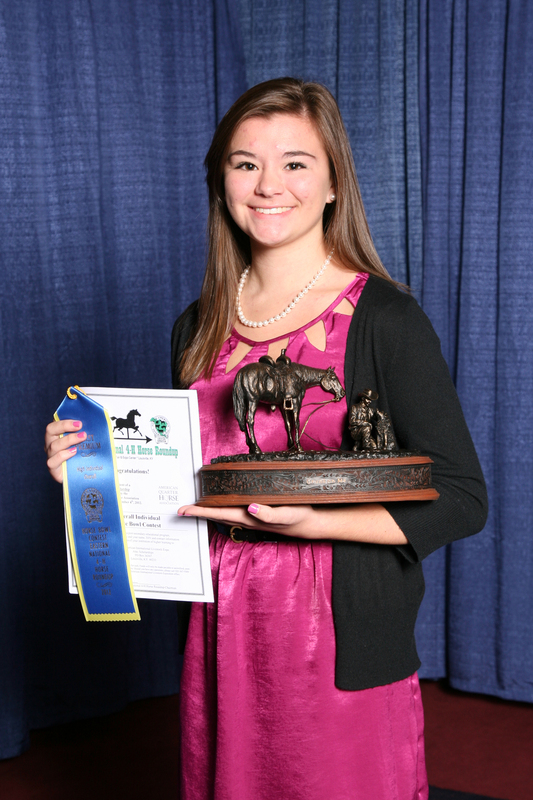 Scholarships – Win one of three 4-H horse program scholarships and continue to seek education beyond high school. Leadership Training – Attend adult and teen leadership training conferences specifically designed to improve horsemanship abilities, equine management knowledge and leadership skills. Craft Horse Contest – Exhibit your sewing or craft skills by creating horse items for your horse or yourself. This opportunity allows the youth to explore and develop economical alternatives for themselves and their horse. Horse Drawing Contest – Broaden your horizons and use your creative talents to increase awareness of the horse project through drawing exhibitions. Horse Painting Contest – Encourages members to apply their artistic talent within the horse project area by increasing their knowledge and skill in equine painting while learning the value of developing visual exhibits for a specific topic. Horse Poster Contest – Provides a medium for youth to visually demonstrate their interest in horses. Enables youth to improve their skills in linking words and visuals to create an appealing display. Horse Photography – Encourages youth to gain self-confidence, while developing life-time photographic skills. While learning the value of organizing and developing visual exhibits, youth will increase their knowledge of photography as it relates to horses. Horse Essay, Creative Writing and Poetry Contests- Learn to become a more effective writer while exploring the wonderful world of horses. To develop leadership abilities, build character, and assume citizenship responsibilities. To experience the pride of owning a horse or pony and be responsible for its management. To develop an appreciation of horse-back riding as a healthy and wholesome form of recreation. To learn skills in horsemanship and an understanding of the business of breeding, raising and training horses. To increase knowledge of safety precautions needed to prevent injury to yourself, others, and their mounts. To promote greater love for animals and a humane attitude toward them. To be better prepared for citizenship responsibilities by working in groups and supporting community horse projects and activities. To teach good sportsmanship through a friendly, competitive atmosphere. To promote future horse industry development and expansion.